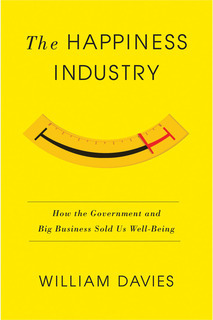 The Happiness Industry: How Government and Big Business Sold Us Well-Being. William Davies. Verso. 2015. Watch out folks. There is a murky world lurking behind the scenes, a sinister cabal of policy-makers, psychologists, CEOs, advertisers and life-coaches watching you, measuring you, nudging you, and monitoring your every smile, all to try and make you happy. We must resist. This, broadly, is the message of sociologist William Davies’ book, The Happiness Industry: How Government and Big Business Sold Us Well-Being. I opened Davies’ book expecting a historical critique of the so-called ‘politics of well-being’, a new movement which rose to prominence in the last decade. Cognitive psychologists like Aaron Beck, Martin Seligman and Daniel Kahneman found ways to measure how our thoughts and beliefs can make us miserable, and how cognitive behavioural interventions can help us to be wiser and happier. The evidence-base they built up persuaded policy-makers – particularly in the UK, but increasingly around the world – that governments can and should try to improve citizens’ well-being. The science of flourishing became, for some policy-makers, a way beyond the cultural relativism bequeathed us by Nietzsche, via a strange marriage of ancient wisdom (Buddhist, ancient Greek) and empirical science. Governments could try and improve citizens’ ‘flourishing’ without being accused of imposing their version of the good life on everyone else. ‘It’s not our version’, they could say. ‘It’s science.’ The politics of well-being is still quite an undeveloped movement, but it’s led to specific policies, such as the collection of well-being data to guide policies; the expansion of free talking therapies; and an on-going attempt to teach ‘well-being’ and ‘character’ in schools. Davies has written well on this movement for the New Left Review. But what we get in this book is a much bigger narrative that looks at the history of the attempt, in economics, psychology, statistics and neuroscience, to measure moods and emotions, and to use that data either to ‘nudge’ us towards policy-outcomes, to sell us things, or to keep us working. The story winds from Bentham to JB Watson via whiplash, social networks theory, the DSM, the history of management consultancy, the Chicago school, the history of stress and the Quantified Self movement. It risks becoming a history of everything, and could more coherently have concentrated on the rise of the politics of well-being in the last decade. The ‘enemy’ of his book seems to be an overly-mechanistic or behaviourist model of the mind, in which scientific experts measure the mood-machine and try to steer it without asking people what they mean or care about. Certainly, the politics of well-being can be anti-democratic and positivistic. When our government came up with a national definition of well-being, for example, it did so via a small panel of experts, entirely made up of economists and psychologists. However, Davies’ story risks confusing the behaviourist with the cognitive behavioural. Much of the politics of well-being sprung from the success of Cognitive Behavioural Therapy (CBT), which arose in the 1960s as a critical response to behaviourism. In CBT, people’s beliefs, meanings and values are all-important, so it’s more humanistic and potentially more democratic. It’s true that CBT can over-emphasize people’s agency, and hold individuals responsible for emotional problems that may be rational responses to adversity and poverty. Like the Stoic philosophy from which it came, it can focus overly-inward. But it’s already developing more collective forms which equip people to change their circumstances (like being in debt to loan sharks) as well as their inner lives. Probably the single biggest impact of the politics of well-being so far has been to increase public funding into talking therapies, and to make mental health a bigger political issue – there is a new campaign for ‘parity of esteem’ between physical and mental health in the UK’s National Health Service (NHS). But Davies ignores this. Instead, he focuses on the possibility of therapy or life-coaching being forced onto benefit-claimants in England and Wales. The Department for Work and Pensions denies this happens, although it may well on occasion, and should be opposed as an ethical breach and a waste of money. But we also need to vigorously defend and expand free therapy for those who need it and want it. Davies doesn’t lift a finger in support. Instead, he lays into corporate wellness programmes and the booming wellness industry, and slams the proliferation of ‘chief happiness officers’ and ‘happiness apps’ monitoring our every smile. He has a point here – companies are increasingly interested in our emotions, and in trying to monitor them. Jaguar, for example, launched a PR campaign during Wimbledon called ‘Feel Wimbledon’, which purports to measure the feelings of the spectators during games. And it’s true that more and more companies are taking their employees’ well-being seriously. However, Davies over-estimates both how widespread and how sinister this trend is. Companies’ attempts to measure emotions remain marginal and gimmicky, like Jaguar’s ‘Feel Wimbledon’ campaign. Happiness apps are not that popular. Companies don’t invest much in their well-being programmes, if they have one at all. Most programmes amount to little more than a salad option at lunch, cheap gym membership, and one away-day a year for wacky team-building and half-baked resilience-training. Hardly Brave New World. The over-riding tone of Davies’ book is the hermeneutics of suspicion – he is constantly expressing ‘unease’, ‘disquiet’ and the need for ‘critical resistance’. This is left-wing academics’ favourite posture, but it’s not really radical in that it undermines people’s agency: the ‘well-being agenda’ is something the elite is imposing on us, not something we are ever developing for ourselves (as is the case with the Quantified Self movement). And his ‘perpetual unease’ doesn’t really change anything. What are you actually for? It turns out Davies is for co-operatives, for co-owned companies in which decision-making is shared. Such companies make us happier, according to research. He’s also for local community mental health initiatives like therapeutic gardening, which also make us happier. And he’s for more equal and less competitive societies, which research suggests make us happier. So on the occasions he’s arguing for something positive, Davies also turns to well-being data for support. At the extreme of his argument, he suggests governments should ignore people’s moods and feelings altogether, and focus on the serious business of improving material circumstances. That’s exactly the argument successive governments have used to deprive mental health services of funding. Hopefully, this is finally changing, but Davies’ book does little to help that cause (a cause I personally believe in). Still, as political movements rise and turn into consensuses, there is a risk of assumptions turning into dogmas, and mistakes being overlooked. There is something to be said for more critical books which keep political movements honest – Davies’ work is a useful contribution in that respect. Jules Evans is policy director at the Centre for the History of the Emotions at Queen Mary, University of London. He is also the author of Philosophy for Life and Other Dangerous Situations (Rider Books: 2012) and a BBC New Generation Thinker for 2013. He teaches practical philosophy at organizations including Saracens RFC and MIND. He blogs at www.philosophyforlife.org. Read more reviews by Jules.